Author’s Note: Since the Burlington mayor’s non-veto veto of his city council’s anti-F-35 resolution, two other affected towns have acted. On April 16, the city council in Winooski, which sits in the airport’s flight path, voted unanimously for a resolution opposing the F-35. Also on April 16, the city council in South Burlington voted 3-1 for an anti-F-35 resolution. No Vermont town is on record supporting the warplane. Burlington mayor betrays majority of constituents for what? 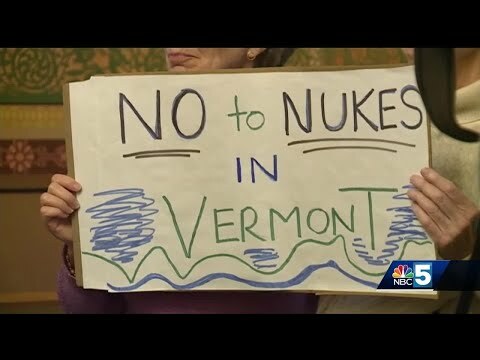 On April 11, the mayor of Burlington, Vermont, announced that he was betraying a 55% majority of Burlington voters and a 75% majority of his city council that had opposed basing the F-35 Joint Strike Fighter at the Burlington Airport in South Burlington. The mayor betrayed his constituents in the limpest way, not by vetoing the popular resolution opposing the F-35, but by sending it on without his signature, while appending a dishonest and misleading cover letter inviting unelected leaders to have their way with Vermont. The third-term Democratic mayor has now asked the Air Force to impose its deafening fighter-bomber on a neighboring city for no cogently articulated reason, following a process bereft of integrity, rigor, or honor. Earlier this year, when Miro Weinberger was in a challenging, three-way race for re-election as mayor of Burlington, he seemed to make promises. He said things that sounded like promises, things that voters reasonably understood to be promises. One of those promises was a deceptively worded non-commitment commitment to reconsider the justice of basing the nuclear-capable F-35 Joint Strike Fighter in the neighboring city of South Burlington, even though South Burlington has no say in the matter. Weinberger was slip-sliding his way along the F-35 question because he has a long, unambiguous record of supporting the military escalation of the airport in the most populated region of Vermont, and this year voters had finally put the question on the ballot, against serious opposition from officialdom. Weinberger, a former airport commissioner, apparently needed to sidestep a question on which he had never shown any official doubt despite health, safety, military, economic and other evidence that the world’s most expensive weapons system was going to do more harm than good to Vermont.